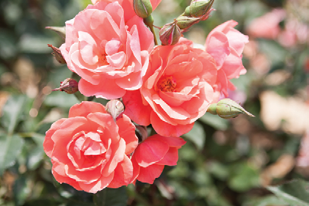 The transaction gives Star Roses and Plants and Ball exclusive rights to sell Kordes garden and potted rose varieties throughout the U.S. and Canada. Effective March 31, Ball Horticultural Co. purchased the assets of Newflora LLC, which included the master license to sell an extensive line of garden and potted rose offerings throughout the U.S. and Canada. Since 2003, Newflora has been the exclusive agent for Kordes, the world’s largest breeder of roses. The transaction transfers the Kordes garden rose license management to Star Roses and Plants, and the Kordes potted rose license management to Ball Ingenuity, a division of Ball. The AmericanHort event has been recognized by the Trade Show News Network and the International Association of Exhibitions and Events. COLUMBUS, OHIO – AmericanHort’s signature event, Cultivate, long recognized by horticulture professionals as their go-to source for new products, new varieties and educational sessions to move their business forward is also being recognized by the trade show industry. Cultivate’16 was recently announced as a Trade Show News Network (TSNN) Top 250 Trade Show, moving up from last year's to spot #130. With a record number of submissions for this list in 2016, AmericanHort is proud and honored by the achievement, according to a press release. A waiting list is available for exhibiting at Cultivate’17. Please contact Sherry Johnson at SherryJ@AmericanHort.org for more information. Registration is now open for attendees at AmericanHort.org/Cultivate. In addition to 100+ professional development sessions, Cultivate’17 offers eight add-on experiences, including CareerUP, three tours, a biocontrols workshop and a succession planning workshop. To learn more and explore key sessions for your industry segment (nursery, greenhouse, landscape, retail, and interior plantscape), please visit AmericanHort.org/Cultivate. The financing will fund commercialization of engineered biocarbon products for production agriculture and the turf, nursery and ornamental markets. GREENWOOD VILLAGE, Colo.— Agriculture technology company Cool Planet has closed on $19.3 million in Series A financing and note conversion to commercialize its Cool Terra and Cool Fauna engineered biocarbon products. Cool Planet is focused on developing products that are simultaneously profitable as well as sustainable and has raised nearly $30 million in the last 18 months. This latest round of funding was led by Agustín Coppel and North Bridge Venture Partners. Celebrate #YearoftheRose with these new varieties. Looking for something fresh to help celebrate the Year of the Rose? Here are several new roses from Star Roses and Plants and Weeks Roses. Read our special 2017 New Plant Pavilion to view nearly 100 more exciting plants. All photos and descriptions were provided by the participating companies. This lovely hybrid tea rose was created in England by the talented breeder Gareth Fryer. The long cutting stems are great for bouquets, and the plant’s excellent vigor guarantees a profuse production of blooms. 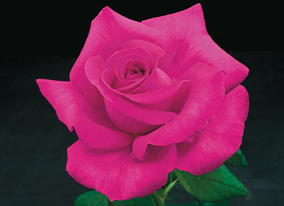 In true hybrid tea fashion, one stunning dark pink blossom sits atop each long cutting stem. The large 4- to 5-inch flowers have 30 to 40 petals. Whether you live in sunny California or in a colder, rainy climate, the color will stay true until the petals drop and the plant will reward you with a show of attractive, semi-glossy medium green leaves. Children’s Hope is a delightful and prolific bloomer that supports the Children’s Brain Tumor Foundation. Every medium red, double-petal blossom is a reminder that each child is a beautiful flower. The blooms are childlike and dainty, measuring just 1.5 to 2 inches in diameter in large clusters that can cover the entire plant. This polyantha shrub rose has a compact habit that makes it ideal for small spots in the landscape as well as decorative containers. It grows well in most climates throughout the U.S., and has very good disease resistance. Every sale of a Children’s Hope helps to support the treatment, quality of life and the long-term outlook for children with brain and spinal cord tumors through the research, education and advocacy of the Children’s Brain Tumor Foundation. 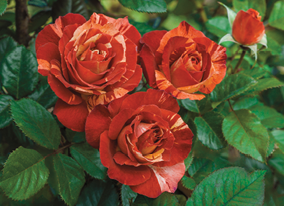 Coral Knock Out offers a new color addition to the Knock Out Family of Roses. The unique coral color is even stronger in hot, humid climates. It blooms from spring through fall and maintains an upright to rounded habit. Young foliage is bronze red which accentuates the bold flower color. Looking for an easy-to-maintain rose bush? Easy To Please is the newest addition to the Easy-To-Love Collection of roses. This pink floribunda boasts blooms that are fuchsia pink with a lighter reverse. The flowers are 2½-3 inches in diameter with 20 to 30 petals each. The plant’s medium-sized growth habit makes it easy to fit into most gardens. Best of all, Easy To Please is easy to grow and maintain, because its disease resistance surpasses many landscape shrubs. This variety grows well in a wide variety of climates and conditions. Enjoy the prolific flowers, the clove fragrance with hints of cinnamon, and the vigor that’s Easy-To-Love. Peachy Knock Out blooms from spring through fall with attractive pink flowers. The overall color effect is peach with the combination of pink petals that become yellow in the center. The color will be much more intense with the cooler temperatures in the spring and fall. The color can fade to blush with the onset of heat and humidity. 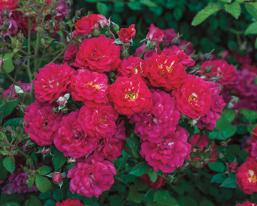 If you’re looking for a new climbing rose to plant this year, Tropical Lightning is it. The tropical warmth of this exciting, exotic colored new rose is generated by a unique flower that’s a combination of sunset orange and a purple smoke layer accented with cream colored stripes. The colors mix together differently on every flower, creating a pleasing striped effect that’s stunning. The canes of this climber reach 10 to 12 feet tall, so Tropical Lightning is both big and dramatic. Each perfectly shaped flower holds its crazy color for days, and the prolific plant only slows down the flowering as it cools down for winter. 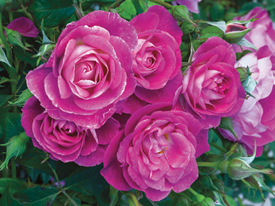 Violet’s Pride, the fourth and final addition to the Downton Abbey Garden Rose Collection, is named for the Lady Violet, the feisty Dowager Countess of Grantham as portrayed by Maggie Smith on the popular Downton Abbey TV show. The lovely lavender blossoms of Violet’s Pride are made even more exquisite by a magenta-colored heart decorating the inner petals. This prolific bloomer produces spiraled, medium-large double blossoms with 35-45 petals. Worthy of winning any Best of Show title, Violet’s Pride boasts a fruity fragrance with a hint of grapefruit that’s worthy of any noblewoman. The flowers are held proudly on top of a vigorous, evenly rounded bush with disease resilient dense foliage. 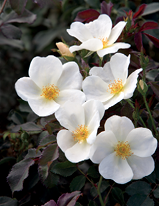 White Knock Out is an excellent shrub rose which stands out in the landscape with the contrast between pure white blooms and very dark green foliage. It blooms from spring through fall and maintains a compact habit.